It's getting a little cooler here in Brisbane... this was Sibs this morning. 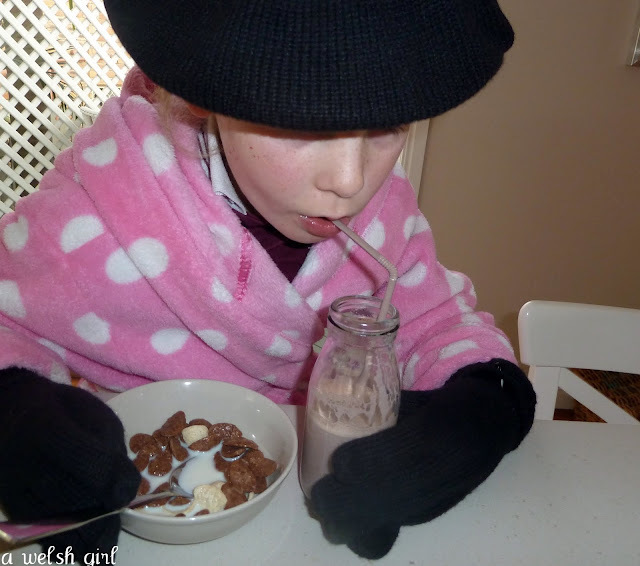 Clutching her hot chocolate with some gloves on and her dressing gown over her school uniform! We all slept in this morning. The three of us! Absolutely unheard of! We woke after 8am...and do you know what we did? No-one rushed around like fools, we knew we were going to be late so we just got on with things. I decided that gentle cajoling was going to work better than the mad panic approach, and it did! Sibs was still a few minutes late for class, but nothing too terrible and we all started the day quite relaxed considering. I mentioned about Twmff trying to escape out of the cat flap in my last post This is the footstool that is now placed in front of the heavy stone that is in front of the cat flap! He doesn't look too pleased with the situation and has now adopted the footstool as his new bed. That is until he goes for a wander and Modlen jumps on it. I snapped this one of her fast asleep - not even the flash of the camera stirred her. Anyhow, last night Twmff didn't wake us up trying to escape as I think he quite likes his new bed and consequently we all missed our feline alarm clock and overslept. It was also quite cosy under the duvets, a sign that Winter has arrived. 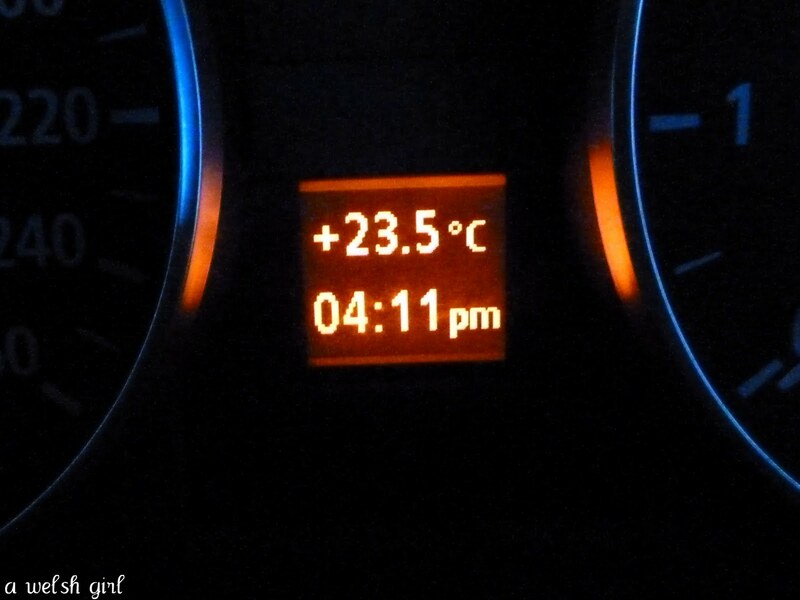 Bearing in mind that it's dark by 5.30pm, this gives you an idea of my Winter!! Today your winter is warmer han our early summer! Wet and cold in the south-east today, after weeks of hot hot weather - good for the gardens though! Well done all of you for achieving a chilled approach to oversleeping - not always easy! Cats!!! But we love em! Our cat Bessie always comes and wakes me if I'm still in bed after 7am! I love winter over here because it is so warm and I can walk around in short sleeves most days. I wouldn't mind just a few freezing cold days all the same. We all slept in today too...thank goodness the school holidays will be here soon!